Marathons are in short supply after Comrades. 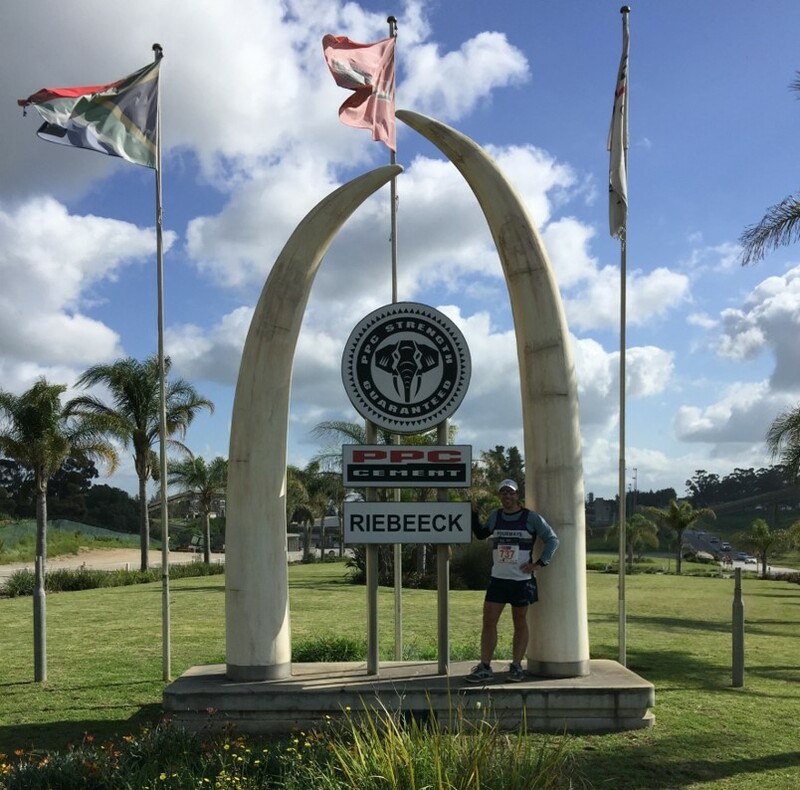 After two long months in the barren running wilderness, I was finally able to fall off the marathon wagon on the first weekend in August with the 33rd running of the PPC Riebeek Bergmarathon (my second). 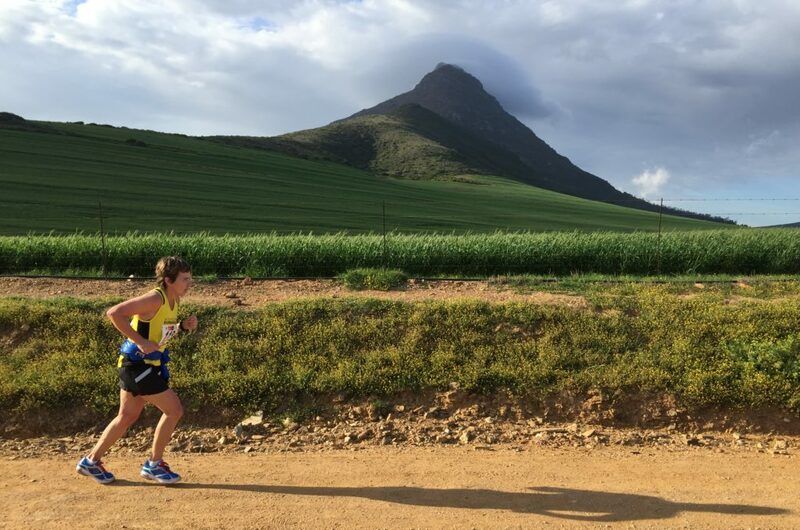 Although I am currently on a mission to run every marathon in the country, I don’t mind doing a few repeats here and there – and this marathon through the heart of the Western Cape’s Swartland is definitely worth a repeat visit. 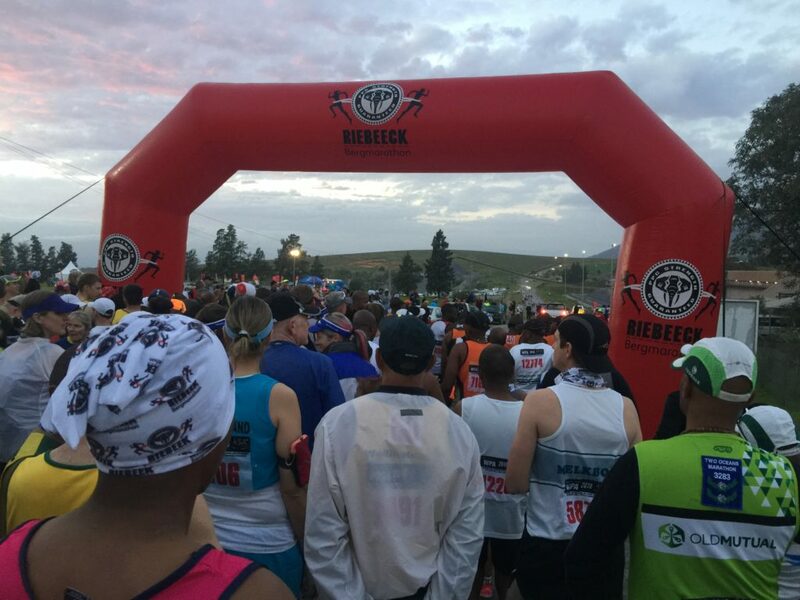 The Riebeek Bergmarathon starts and finishes at the PPC Cement Factory. Whilst the factory itself is very Dickensian, the beautiful grounds include a working vineyard and have historical significance as the birthplace of Jan Smuts. The marathon is conveniently timed to coincide with the start of the Gauteng private schools’ August holiday. My mom still lives in the Cape so the marathon provided a great excuse to bring my daughters along to visit Granny whilst giving my wife a few days off from motherly duties. The result is that Mom gets a break, kids get spoilt by Granny and Dad gets a marathon – I would call that a win-win-win scenario! 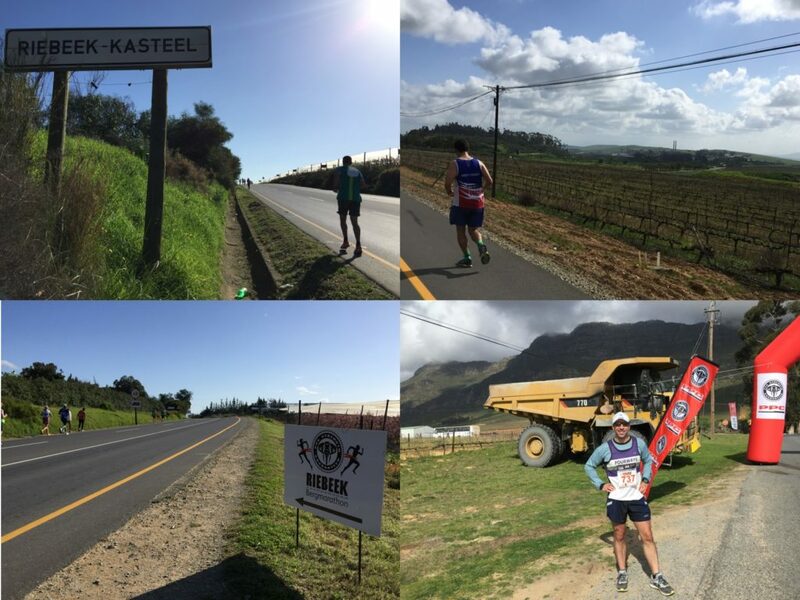 The race takes place around the small picturesque twin towns of Riebeek-Wes and Riebeek-Kasteel. Although the Riebeek towns are only an hour’s drive from the centre of Cape Town, you are in another world by the time you cross the Bothmaskloof Pass and drop down into the Riebeek Valley. The ‘getting away from it all’ sentiment is catchy – both towns have grown steadily over the years via an influx of migrating Cape Townians who, unable to cope with the stresses of big city life and a 20-hour work week, escape to the Riebeeks. The Riebeek Valley is a short drive from Cape Town (Image from www.riebeekvalley.info). 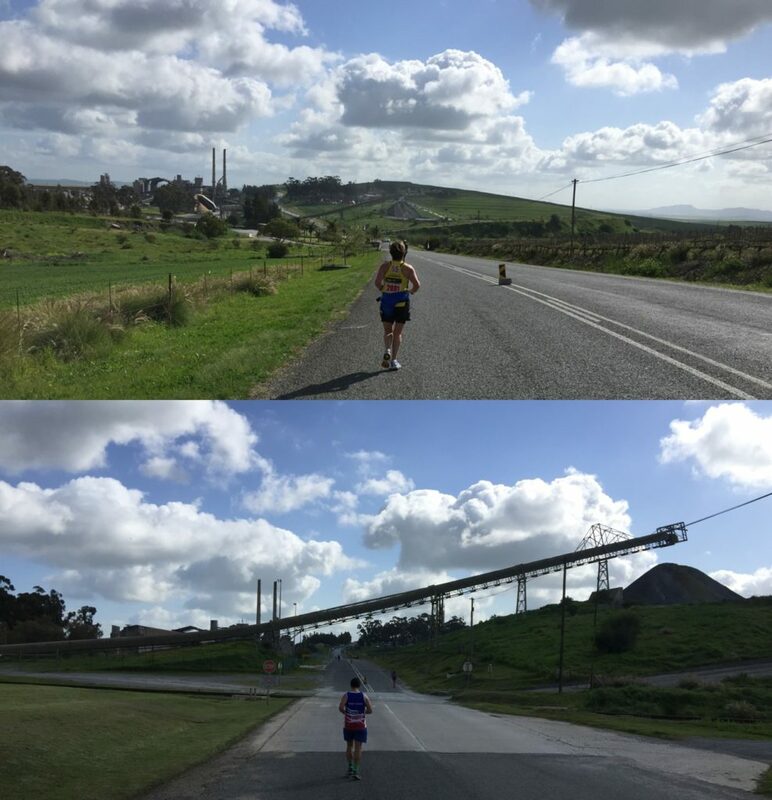 The race starts and finishes inside the PPC Cement factory just outside Riebeek-Wes. This does not sound like a particularly glamorous venue but I assure you it’s one of the best you’ll get to experience. I love contrasts and the odd mix of Dickensian industrial machinery against the background of pristine vineyards, backdrop of unspoilt mountains and back story of one of the oldest towns in South African history is unique. The original farm, Bovenplaats, on which the current PPC cement factory is situated was the birthplace (24 May 1870) and childhood home of former Prime Minister Jan Christiaan Smuts (known as a great statesman and the only person to be a signatory on both the League of Nations and United Nations as well as the treaties ending both World Wars). The cement factory grounds are still used as a working farm and the house Jan Smuts grew up in has been preserved as a national monument that can be visited*. * Jan Smuts was cremated and his ashes scattered around his farm in Irene (near Pretoria). It was a pity he was not buried in the PPC factory because then you would be able to visit his ‘cementary’. Just as Jan Christiaan was getting potty trained, another baby was born a few kilometres down the road on the farm Allesverloren (now a famous winery). This baby’s name was Daniel François (subsequently shortened to DF) Malan – and 70 years later the battle between the two farm boys turned the Riebeek country towns into an unlikely political hotbed. Jan Smuts, served a first term as Prime Minister of the Union of South Africa (from 1919 to 1924) and was re-elected into the position a second time in 1939. The 1948 general elections saw the incumbent Smuts and his Union Party losing to DF Malan’s National Party. Malan assumed the Prime Minister role, laid the foundations for apartheid and the National Party remained in power until South Africa’s first democratic elections in 1994. 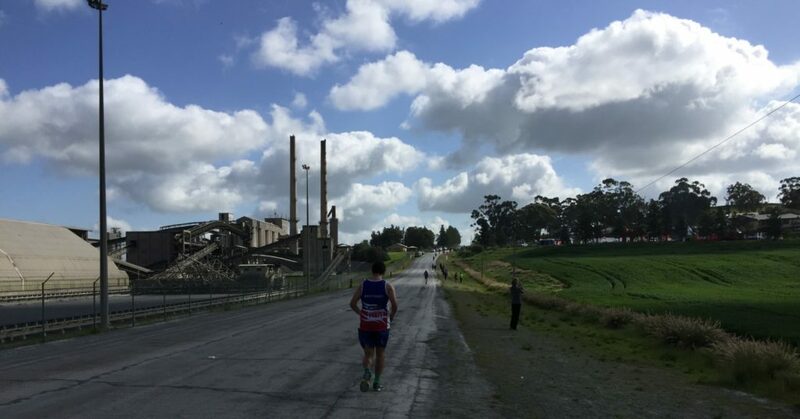 When I first ran this race in 2016, I got chatting to a local runner who told me that animosity from the legacy of the Union / National Party division was still evident in the towns until recently. Ancient political battles aside, the people in the Cape are pretty laid back – and the sun follows the same ethos, only rising at around 7:30 am in August. Since the race organisers don’t want you to miss out on any of the great views on offer, the race start is timed around sunrise which allows those driving through from Cape Town a decent lie in. If you don’t fancy an early morning drive, there are plenty of local accommodation options. Every South African country town seems to have a “Royal Hotel” but the original one (and oldest hotel in the country) is in Riebeek-Kasteel – and while you are there you can relax on what is officially the largest stoep south of Limpopo. This year I chose to drive through on the morning of the race and arrived in plenty of time to register and enjoy a couple of cups of complimentary coffee before joining the other runners at the start line. The event has roughly 2,000 entrants who are released via staggered starts. The marathon sets of first and race MC Sean Falconer ensured that no overenthusiastic 21km, 10km or 5km runners joined us and got more than they bargained for. The gun fired and 350 hardened marathon runners headed away from the cement factory through the morning mist. With a little over 2kms successfully navigated, you hit a T-junction and proceed left on the R311 (the main road connecting the towns) towards Riebeek-Wes. About the Sponsor: Pretoria Portland Cement (PPC) have sponsored the race since its inception in 1986. PPC was established in 1892 and is a leading supplier of cement and related products in southern Africa. Their 11 factories around Africa produce around eleven and a half million tonnes of cement products annually. They are also a major lime manufacturer – supplying roughly 60% of the lime consumed in southern Africa from their plant in the tiny town of Lime Acres in the Northern Cape. 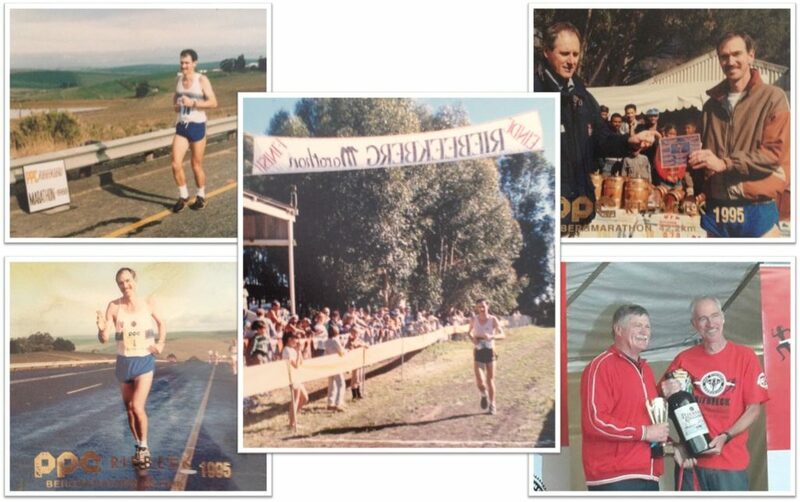 Lime Acres plays host to the smallest Comrades qualifying marathon in the world. 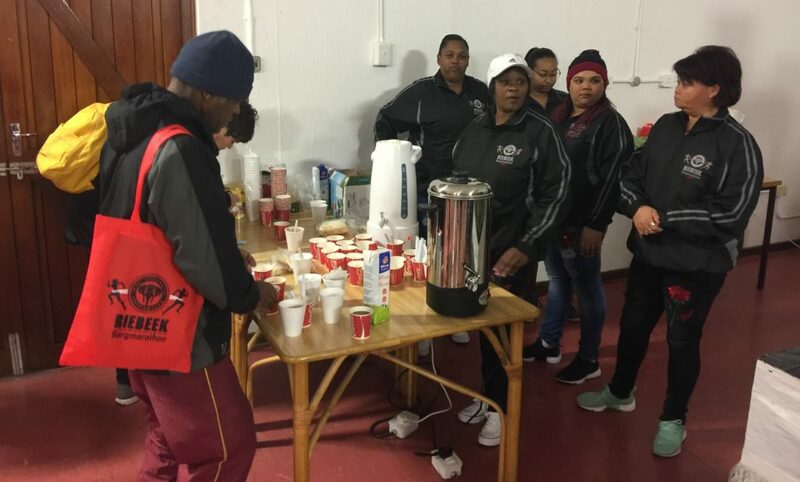 PPC provides free travel and accommodation for their Lime Acres staff (and staff from their other factories around the country) to run the Riebeek Bergmarathon. Allesverloren (meaning ‘All is Lost’) is probably the best known winery in the area. It was named in 1704 after the widow Cloete returned from a Stellenbosch church trip to find her home burnt to the ground. After running past several wine farms (including Allesveloren) you hit the Riebeek-Wes high street. From there you continue towards Riebeek-Kasteel but, before you quite reach the second town, you turn around and head back along the same route until you pass the cement factory turn-off again. 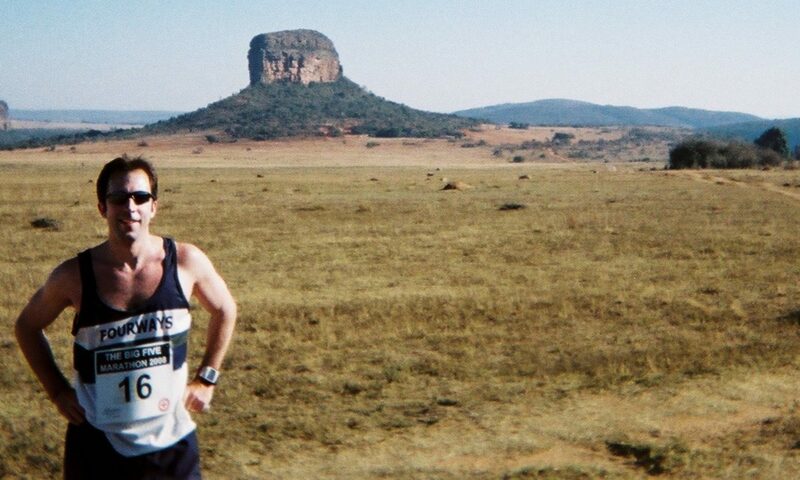 This is my least favourite part of the race – the road and surrounding scenery are interesting enough but you do the same 5km stretch of road three times (you also come back to the cement factory via the R311). Having got that bit out of the way, the rest of the route is simply fantastic. At about 14km you turn onto dirt road and head past wheat and dairy farms whilst enjoying the spectacular backdrop of the Kasteelberg peaks. After negotiating several kilometres of undulations and frivolous hills, you get your first serious hill – a monster 6km climb that gets steeper and steeper as you grind your way towards the summit. At this stage, the lazy sun still hasn’t risen high enough to crest the Kasteelberg peaks so you do your mountain climbing in the shade. The wind however is wide awake, pumping icy gusts at the ascending runners – and one is faced with the choice to walk and get cold or slowly shuffle along and keep warm. 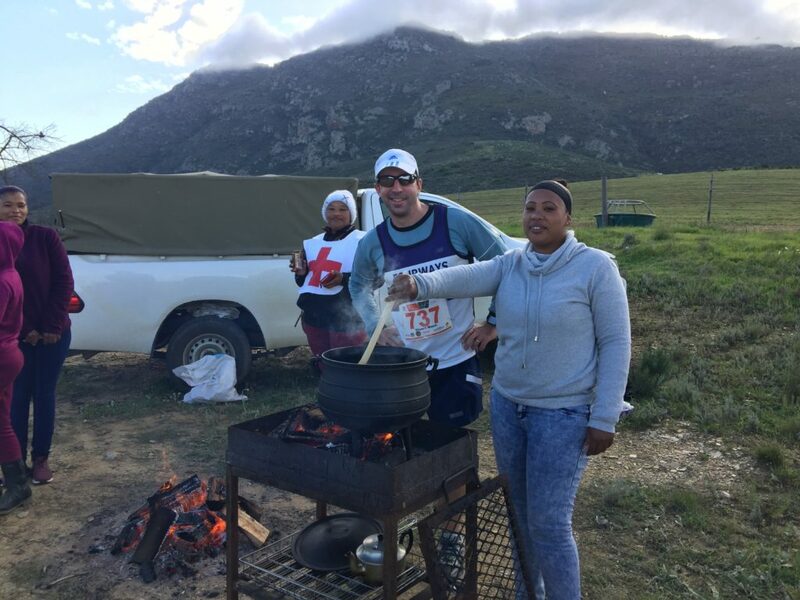 Cooking traditional Cape Malay “smoor” in a potjie on top of the Kasteelberg. Unfortunately I ran too fast and it was not yet ready for tasting (they promised to start cooking 30 minutes earlier next year). It was bitterly cold on top of the mountain so I enjoyed the open fires. The Red Cross lady is drinking ginger (as opposed to real) beer or I would have feigned a medical emergency to get some. 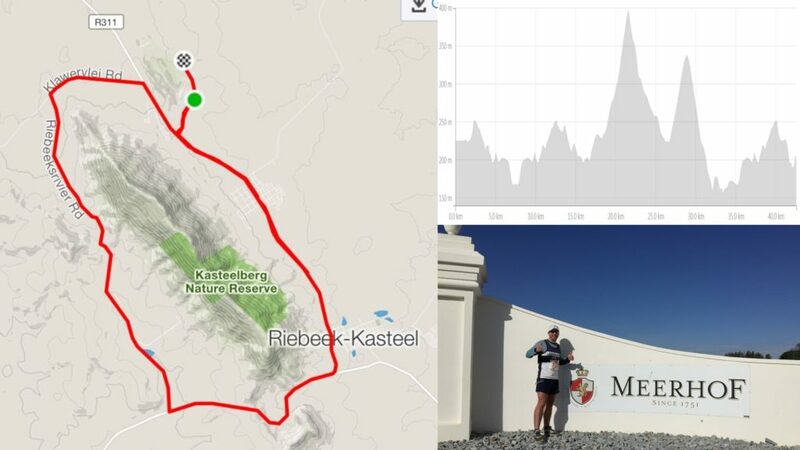 A successful summit means you’ve reached both the halfway mark and highest point on the route – and your reward for getting there is five easy kilometres down the backside of the Kasteelberg. 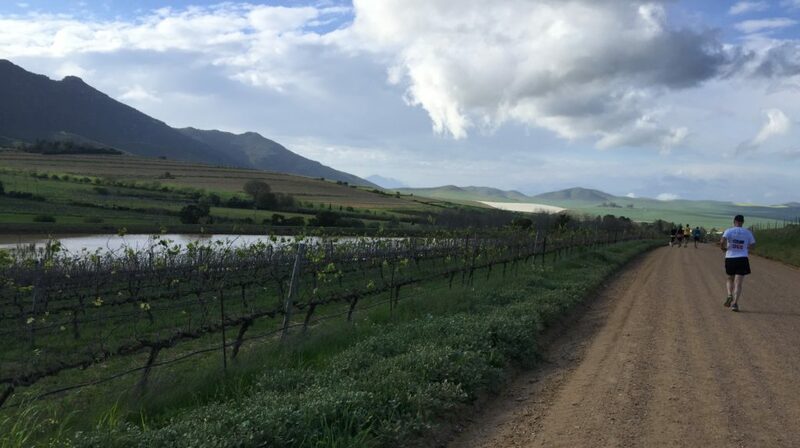 Grapes are the crop of choice on this side of the mountain and your steady descent can be enjoyed as one cruises past some fine examples of Boland viticulture that distract you from your next challenge – the Porseleinberg. Before you get can carried away in the natural beauty of the route, the race brings you back to reality with the double jolt: A return to the tarmac and the toughest climb on a tough route – the treacherous Bothmaskloofpas. Although just 2km long, the altitude difference is 111m with the gradient reaching 7% at the steepest points. This forces most of the field to engage their lowest gear and walk slowly to the top. This is the look you make when you’re wearing the race sponsors kit and get caught walking: PPC make cement and these guys all had cement legs going up the Bothmaskloofpas – the toughest climb on a tough route. Once at top, the view over the Riebeek Valley is fantastic. However, this is a course that liberally dishes out the rewards to her diligent runners. 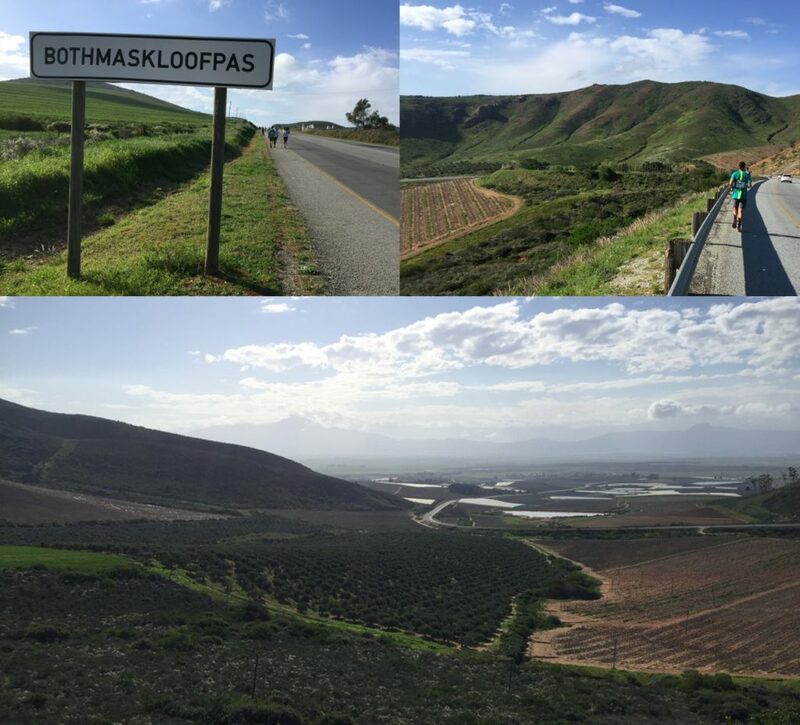 The top of the Bothmaskloofpas brings the wonderful vista of the Riebeek Valley into view – a truly spectacular sight to enjoy as one plummets down into the Valley and the lowest point of the route. 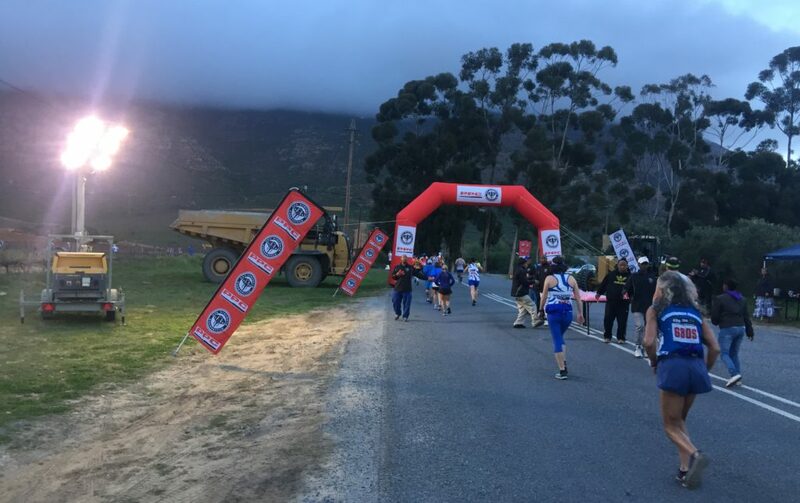 With just 10km to go, the terrain changes once again and you are now surrounded by the olive groves that mark the outskirts of Riebeek-Kasteel. The hard work starts once again with 8km of steady climbing to get back to the PPC factory turn-off which is at the 40km mark. 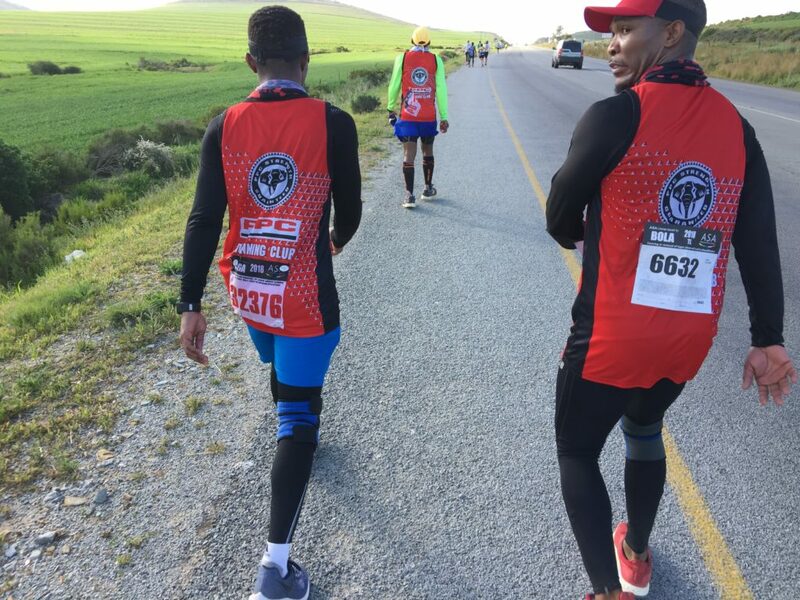 The good news is that the last 2km are easy downhill, the bad news is that you still need to run a further 200m to make up the full marathon distance and this last stretch is a perpendicular pull that tests your worthiness as a Riebeek Bergmarathon finisher. There is always a good crowd relaxing around the finish area and it feels as if all eyes are on you to check whether your charge to the finish line falters to a walk up the nasty, final pull. Having spent several hours running through the best of Swartland wine, wheat and olive country, you can now browse the various stalls surrounding the finish area and replenish your reserves by sampling some of the local produce. 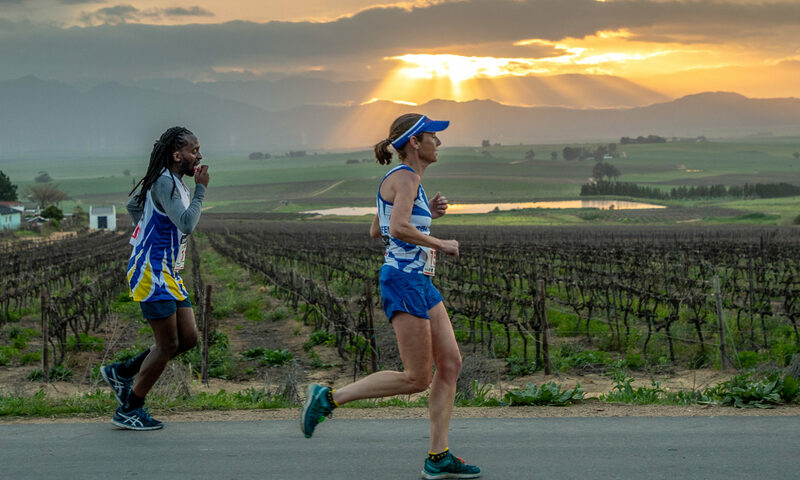 If you want to prolong your stay, the Riebeek Valley has plenty of great restaurants and wine farms to explore after the run, making the race an excellent excuse for a weekend escape. 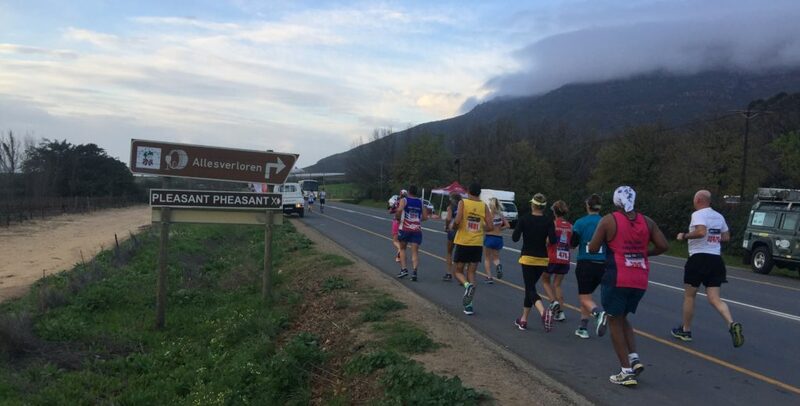 I would recommend every South African runner run this marathon at least once – but beware that once you’ve got a taste of the Riebeek Valley you’ll probably want to make it an annual visit. One runner who can’t get enough of the race is Brian Rothman – he has run all 33 editions of the race! 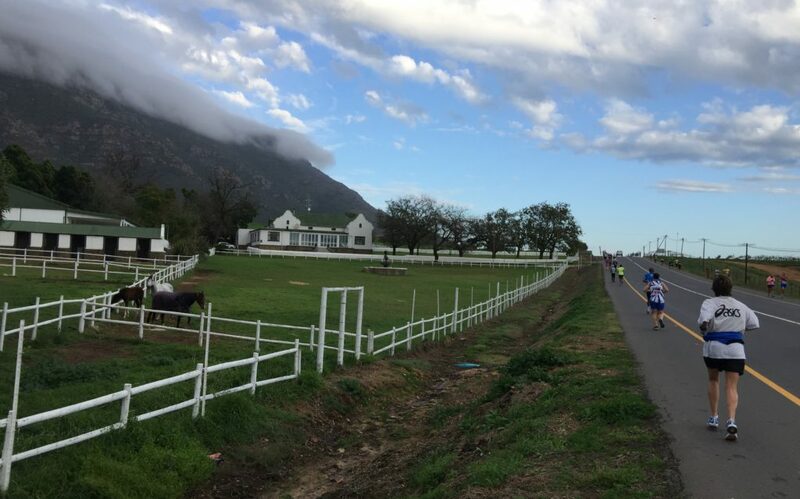 If you’ve never been to the Riebeek Valley before, block out the first weekend in August next year, pay them a visit and run their marathon. You never know, it might become a habit and in three decades time you could be challenging Brian’s record number of finishes! Most of the tables and crowds come from the PPC factory-workers and their families. I was very surprised that there was not more direct involvement in this event by the wine farms and local businesses (since they would be the biggest beneficiaries from the annual influx of visitors). In conversations with Andrea Meyer (from the race organisational committee), I know that this is something that the organisers are working on. Personally, I feel this this race has the potential to be the South African version of the world-famous Marathon de Medoc (where you run a marathon whilst doing wine tasting) – and evaluating the annual vintage would definitely be something worth returning for every year! Signing out from the heart of the Swartland. 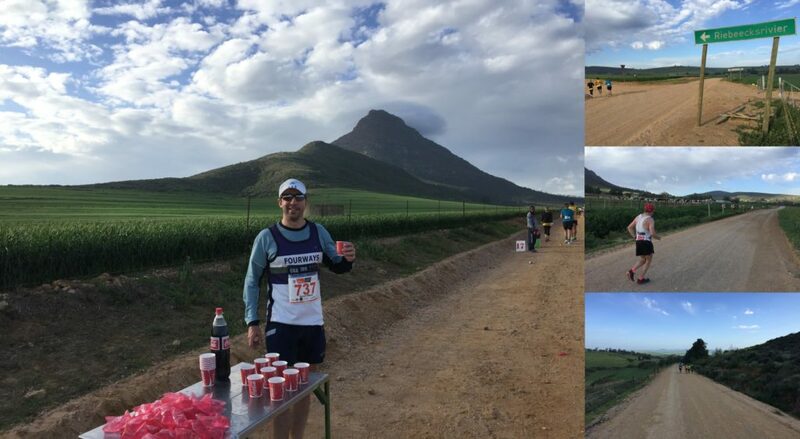 Look out for the next race report – The Blood Buddy Ultra from Memel to Newcastle. Previous PostPrevious Is Road Running Still (Unconsciously) Sexist?